A fine example of this decorative and important map of Northumberland. 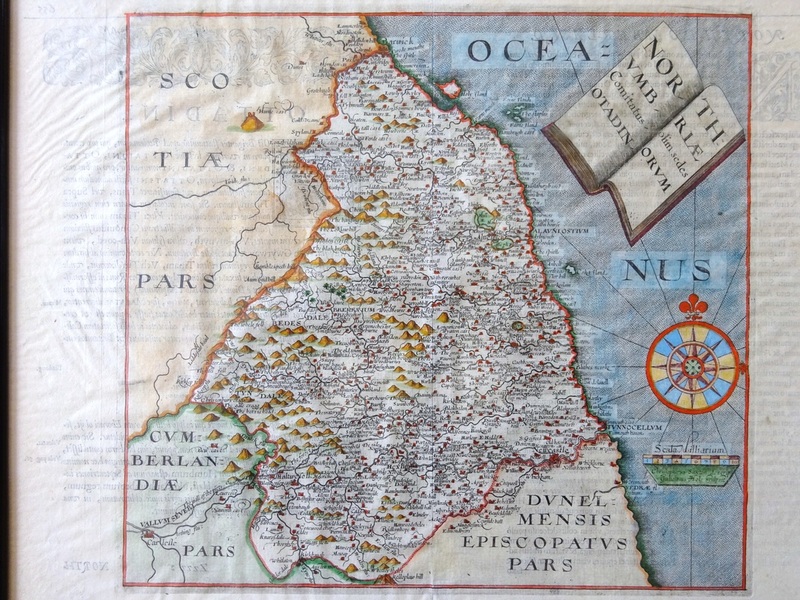 In 1579, in the first atlas of counties of England and Wales, Christopher Saxton's maps frequently showed counties together as geographical regions rather than as independent entities. However, when maps were commissioned for the 1607 edition of William Camden's historical guide to the country, "Britannia", the engravers, William Hole and William Kip, though copying Saxton's detail, in the main, depicted each county in a separate engraving. Camden's "Britannia" with maps by Kip and Hole appeared in three editions of 1607, 1610, as here, and 1637. William Camden (1551-1623) was an English historian and antiquary who devoted himself to the study of the antiquities of Britain, travelling round the country visiting sites. The results of his work were brought together in the "Britannia", published in 1586. However, one of the few criticisms levelled at this work was the absence of maps. This failing was remedied in the sixth edition of 1607 for which maps were commissioned two of the most prominent London engravers of the day. Drawing on the surveys of Saxton, John Norden and the Anonymous/William Smith series, they produced a series of 57 maps. The maps are clearly engraved, often with decorative cartouches and elaborate scrollwork and coats of arms; coastal counties being decorated with ships and sea monsters, and all maps done in a unique and decorative style. These maps form an attractive and popular series, and are becoming increasingly rare.